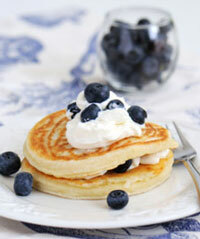 Soft, fluffy pancakes filled with juicy blueberries. 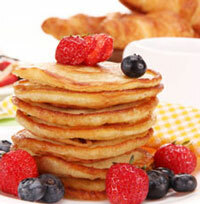 Does this buttermilk pancake recipe sound like the makings of a great breakfast? We have added whole-wheat flour for some added fiber, but you could use ordinary flour instead. 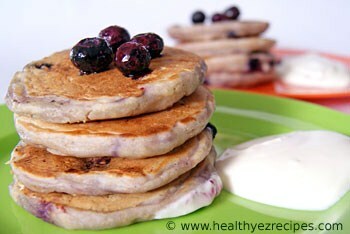 We’ve also added some blueberries for some sweetness. In spite of its name, buttermilk isn’t made from butter. 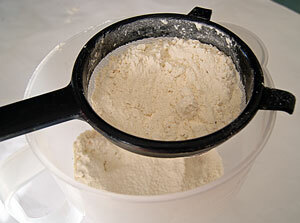 Traditionally buttermilk was the by-product left over from churning butter. The liquid left in the churn after the butter was removed came to be known as buttermilk. These days, however, what you buy in the supermarket is more likely to be cultured buttermilk and is made by adding lactic acid bacteria, mold, or yeast to milk. Buttermilk is characterized by its slightly acidic and sour flavour. Often used in baking, it gives baked goods a light and airy texture and its tangy flavor goes well with fruit. It is also low in fat and often used in recipes to reduce the fat content. First you need to melt the butter or margarine then set it aside for 5 minutes. This will give it time to cool before adding it to the other. Sift both flours into a bowl. This aerates the flour and results in much fluffier pancakes. You will be left with the bran flakes in the sieve. Don’t throw these out, just add to the flour mixture and give a quick whisk. Add the sugar to the flour. 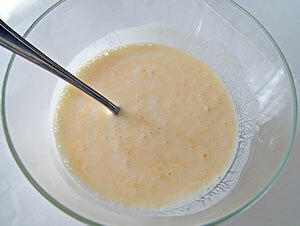 In a separate bowl, whisk together buttermilk, egg, vanilla and melted margarine. 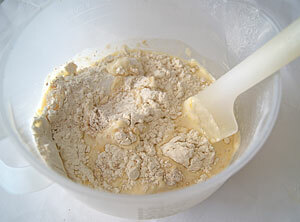 Make a well in the center of the flour and pour in the buttermilk mixture. Gently stir until Add to the flour mixture and gently stir until almost combined. 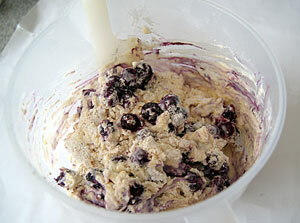 Add the blueberries and continue folding through the mixture. Stir the batter only until there are no more lumps or streaks of flour. I always think over-stirring results in a tough, chewy texture, plus you want to keep the blueberries intact. Heat a frypan or griddle to medium high heat and grease with a little butter or margarine. Scoop out ¼ cup of batter and drop on to the frypan. Cook the pancakes for 1 – 2 minutes or until bubbles appear in the batter. Then turn the pancakes over and cook for a further 1 – 2 minutes or until golden. Remove and set aside on a plate. Repeat with remaining batter. If the batter is too thick add more buttermilk to the mixture.